Just a quick update until I get a bit more time! I now have a newsletter, which you can subscribe to from any page on the website, up in the top right corner. The plan is to use this to keep you informed of whats going on without you having to keep visiting the blog, and giving some cool extras to people like yourself who are kind enough to support Jamo Games. I'm also showing Dr Bones on an iCade at Launch Conference in Birmingham next tuesday and wednesday, with some cool characters on show too at our stand, so make sure to come and say hi if you are there! I still need to finish up the characters, but I'll post some photos up when they are ready sometime over the weekend. Bit of a gap between blog posts, not quite sure how it got that long! Here is the latest update for Dr. Bones! You get three challenges at a time, that must be completed in order to level up, which gives you a coin bonus. There are 20 levels in all, each with three unique quests, so a lot of different things to try and do! 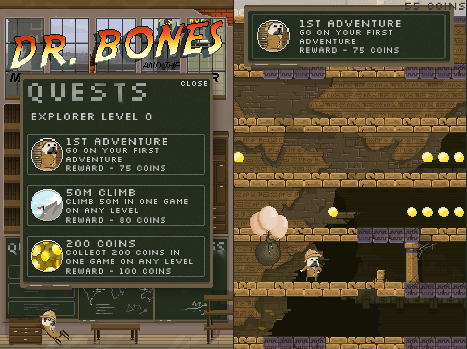 You can view the quests from Dr. Bones office, on the pause menu, and get a summary of how you are doing at the end of each level. The popup you can see on the right will appear whenever you complete a challenge. I have updated the menu to make it look a lot fancier, I think it makes a big difference. This is how it looks now (still not quite finished). You can't see from the picture but the camera rises up above Dr. Bones' office to show this view over London. This is where you will access the shop and choose where you want to visit. Each area has its own high scores, and its own display of curios that Dr. Bones has collected to prepare him for his journeys! Visiting the shop will allow you to buy maps to new locations, new equipment and fun new characters to play as in case the novelty of being a gentlepug ever wears off (as if it ever could)! 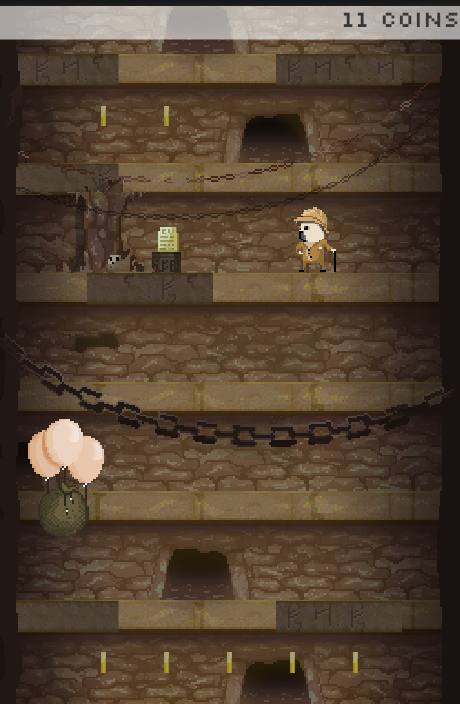 There are now 50 different treasures for you to collect from the various different locations within the game. You can show off your treasures in your office, and collecting each one gives you a coin reward too to help you get those new treasure maps! These are a sample of some of the treasures that you can find. To see them all you will have to play the game! 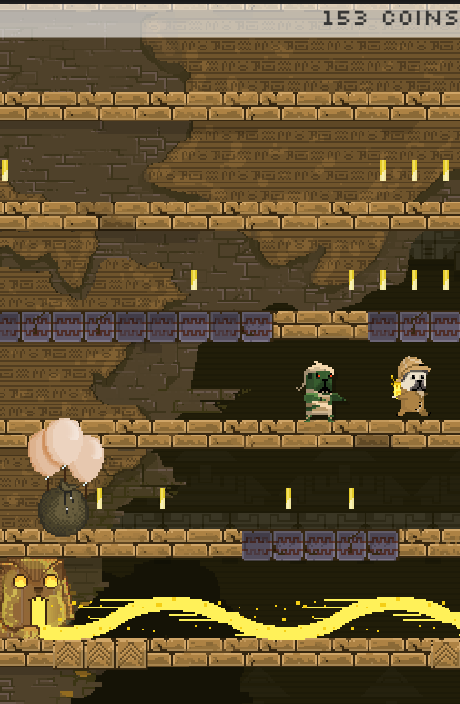 There has also been quite a lot of other content added, including new enemies in most of the zones, finishing off the different locations and creating a shop, but they are mostly too rough to show just yet, but there will be more to come in future updates. 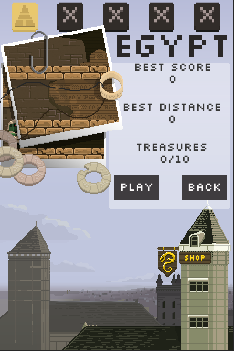 Next I will be working on adding yet more content into the levels, and working on game balance, which will include shop item pricing, treasure and level rewards and adjusting difficulty in the locations dependant upon the distance that you achieve. Something that I want to become key at Jamo Games is finding depth in simplicity. What this means is that a game must focus in on one or two core mechanics, and then explore them as fully as possible. I have been trying to analyse some of my favourite games, and this is a big common thread that I found between them all. Fully exploring mechanics is by no means simple, but then good design isn't, and if you find that you need to add new mechanics into your design to make it more interesting, then maybe it just isn't interesting in the first place, or maybe you need to explore your core mechanic more first. Amp, Watts & Circuit out tomorrow! Just a quick one, Amp, Watts & Circuit is out on iPhone and iPad tomorrow (13th September 2012)! Also, to celebrate the release and to help fund our next project, Amp, Watts & Circuit on PC and Mac is Pay What you Want! This means that you can set your own price, and get a great game for next to nothing (or all of the money in the world if you are feeling generous)! You can go set your price on Indievania. Bit of a lengthy one today, but it's important, so hopefully we can find some answers. My background in games design comes from working in serious games, that typically being games for health, education and awareness. A job would usually start by having a brief, this could be a game to teach people X, or make people aware of Y, or something much more vague. From this starting point, a thousand different games could be designed that can potentially answer the question you need it to, but clearly understanding the core question that the client has asked is the key to a successful project, not the end product itself. At university I studied illustration and graphic design. Not strictly game related, but I often answered the brief with a game, not necessarily a video game but a game of some sort, something for people to interact with and have input on. It seemed to me a medium that was always maleable to whatever question I wanted to answer, the interaction between the viewer and the product much more meaningful than with any image or video that I could produce. The briefs that we were given were often very vague, much more so than the client work that I undertake now, but that initial question that they posed allowed me to get that question that I fed from for my work. I did well at university, graduating with 1st class honours, and have managed to do well so far in my career as a games designer in serious games, going forward to where I am now with my own studio, and a place on a technology incubator in Birmingham. Part of the reason that I started Jamo Games was to give time to my own projects, as well as independence on client work, but recently I have found that the client work has been much more fulfilling, so much so that people have commented that I get more excited when talking about client projects than I do about my self initiated work, which is in conflict with my own interests. It's been concerning me lately, and I have been wondering why it is the case. I think I have the answer, and it is because I was lacking a question. This should not be confused with lack of ideas or designs, I could quite happily sit down and design and develop games which some people would enjoy, I have already been doing so. Lacking a question is more to do with why you are making this exact game, why these specific mechanics, than what the mechanics are. It may well not be the case for anyone else so far as I know, but for me to feel fulfilled with a project, I have to answer the question, even if I end up with a well made, enjoyable final product. The question seems to be the most important and for me, challenging, part of game design. The mechanics, scene and style all fall into place eventually to answer the question as well as you can, and without it you are just making. That isn't to say that there is anything wrong with making, quite the opposite, it is the only way to hone your craft, but the important thing to note about the question is that it doesn't matter what the game genre is, or what the mechanics are, that is your interpretation. Taking the client brief "make people aware of Y" as an example question, it does not infer any kind of mechanic or setting. "Try to make a platform game with flight elements" however may be a question, but not the kind we are looking for. You will encounter these design questions during development, but it doesn't give you the why for the project. I have no doubt that cracking this, finding your question, will lead to stronger, more intelligent projects, and is a much better starting point than trying to advance or put a twist onto older, existing game designs. The question then for me, is where to find it. The question could be found from anything, and the answer can be bent to fit your studios preferences, skills and platforms, but what is it that you use for your question? Do you use one, or if not, do you think you should? I am sure that once I can crack this essential part of design, my game design will improve vastly, and with it I will be much happier with my work. Its devlog time again, quite a lot to show this time around! I've been trying to get a solid base in place for all of the zones in the game now, and just managed to finish that off this morning. There are 5 in total, and each one has it's own set of traps, enemies and treasures, although there are still a lot of those missing. Here are some in-game shots of the zones that you won't have seen before, along with some new traps and things too! This is a screen showing the egypt zone. It's meant to be very hot, with lots of fire. I think it is getting there now, the cat-sphinx seems to have gone down pretty well with everyone who has seen it so far. The parallax isn't so strong on this one as the far background isn't very prominent, so I'll take a look at this. Other than that it just needs more content like all of the zones do. Notice there is a treasure on Dr. Bones' back, that is how you carry things back to the balloon. You can only carry one thing at once, and you can't drop a cursed treasure until the curse wears off, so be careful! A secret burial ground underneath Stonehenge! Still a bit barren at the minute, but watch out for Merlins magic on this one. Because there is no far background in the burial ground, the depth comes from objects closer to the foreground, in this case the chains. It is quite effective, but a bit to repetitive at the minute. 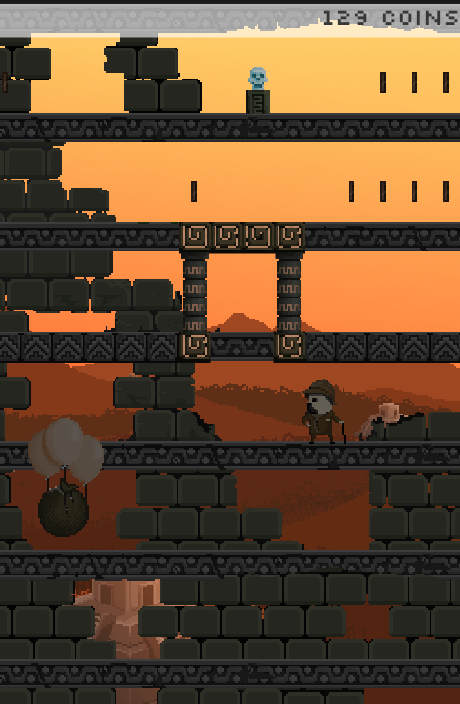 Lots of work left on this zone, as other than spikes there are no obstacles! Uxmal, Mexico. This zone takes place at sunset, so it is backlit. This gives the level a different feel to the others, and you have to keep an eye out for things hiding in the dark parts. Note the crystal skull at the top of the level, a famous Mayan artifact. Will you be able to collect one? That's it for today, I'd love to know what you think of the locations, and what awesome traps you would like to see in each zone. If there are some great ideas I might even build them into the game, so feedback is always welcome! Jamo Games. Powered by Blogger.